Right-click on the tray icon, at the bottom right corner of the screen. Choose Check for updates in the tray menu. AquaSnap will contact our server and if a new version is available you will be offered to install it. Click on the Update button. The latest version of AquaSnap will be automatically downloaded and installed. Run the MSI installer by double-clinking on the file AquaSnap.msi. 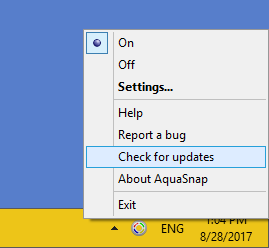 The MSI installer will automatically update your installed copy of AquaSnap. Is there a portable version of AquaSnap?